Promoting pride in country, respect for the flag and appreciation of our freedoms are the primary purposes of Exchange’s Americanism programs. These time-tested activities afford every Exchange Club the opportunity to create greater community awareness of the privileges of American citizenship, and all clubs are urged to actively participate in them. The Americanism projects include the Freedom Shrine, One Nation Under God, Proudly We Hail and Project GIVEAKIDAFLAGTOWAVE. For more information on how to implement Exchange’s Americanism projects, see the Americanism Projects Guide . For information on purchasing Americanism project supplies see the Exchange Marketplace . The Freedom Shrine is an impressive, permanently mounted collection of 30 of the most important and historic American documents, including the Declaration of Independence, the Constitution of the United States and the Gettysburg Address. Freedom ShrineThese remarkable documents serve as windows to the world of America’s proud past. They show our nation’s youth the strength and courage of their forefathers by allowing them to read, with their own eyes, the immortal words of inspired Americans who so decisively changed the course of history. While Freedom Shrines may be presented at any time of the year, Exchange Clubs are especially urged to conduct at least one presentation during the month of May—Freedom Shrine Month. For more information on the Freedom Shrine, visit the Virtual Freedom Shrine Web site. For purchasing information see the Exchange Marketplace . 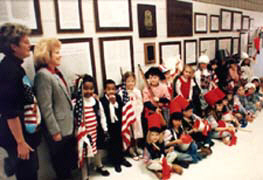 This is an easily implemented and effective program designed to cultivate a deeper sense of patriotism and to heighten young Americans’ appreciation and admiration for our country’s flag. Flags with National Exchange Club identification are available from the supply department. The powerful program not only aims to increase appreciation of our rich religious heritage, but also seeks to remind Americans that we must always trust in a higher power for guidance, protection and strength. The famous words of the program’s title are, of course, taken from the Pledge of Allegiance to the Flag. One Nation Under God Month is observed annually during November. 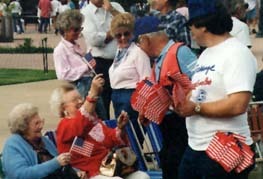 Exchange Clubs can implement this program in a variety of worthwhile ways, such as organizing community-wide prayer breakfasts, distributing pamphlets describing the American Flag’s history and proper display, sponsoring One Nation Under God essay or poster contests in schools and encouraging attendance at religious services. No symbol better signifies our nation’s greatness or inspires respect and love of country than our American flag—the Stars and Stripes. That is why The National Exchange Club encourages all Americans to properly fly the flag as an ongoing, highly visible expression of that respect. To accomplish this simple goal, Exchange has an effective program known as Proudly we Hail. It encourages regular display of the flag by individuals, commercial establishments and industries by honoring them through the presentation of a specially designed plaque. Every club member can participate in the program because it is the individual member who watches for and nominates potential recipients. This outstanding program promotes Americanism as well as community recognition by the sponsoring Exchange Club. The real political power in this country lies with people who have never used it—the people who don’t vote. The National Exchange Club has developed this project to encourage Americans to “Get Out the Vote.” Americans are given the freedom of choice—to choose which candidate to elect or whether to vote at all. An alarming number of citizens are choosing the second option, leaving only a handful of people to decide who will run our country. Through this exciting program, clubs will educate and encourage people not only to register, but to cast their vote on election day.